If you're thinking about dropping by our Gently Used Plant Sale on Wednesday or Thursday of this week to scoop up some of the delicious orchids from our OrchidDaze display you may want some information about how to grow them. I'll post a new care sheet each day this week for you. The Pansy Orchids are gorgeous. Miltoniopsis is a genus of six tropical orchid species native to Costa Rica, Panama, Venezuela, Colombia and Ecuador. They grow in moist humid forests ranging from warm lowlands to cooler highlands up to 2200 m. The hybrid offspring of these species which are commercially available today have been bred for large flower size and warmth tolerance. The hybrids typically flower in April, May and June, but commercial growers can force them into flower year round by giving them two months of short days at 68º, followed by two additional months of short days with nighttime lows between 52º and 58º. Miltoniopsis need to be shaded from hot sun. A couple of hours of mild morning sun in an unobstructed east window is good. In a greenhouse 75% shade. Miltoniopsis like mild temperatures. Try to keep the daytime temperature below 80º. Most orchids like a 15º difference between the daytime high and the night time low temperature. 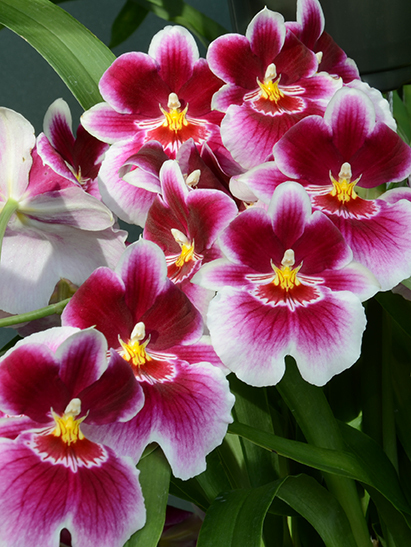 Miltoniopsis need cool temperatures at night (52º to 58º) in winter in order to set buds. 70% to 80% is ideal. Grow Miltoniopsis in relatively small pots. Two mixes work well for us: a bark-based mix (equal parts fine fir bark, charcoal and perlite) or a moss-based mix (equal parts New Zealand sphagnum and tree fern fiber). Repot every two years. Miltoniopsis should dry slightly between watering, but never become bone dry. Drench thoroughly. The drainage holes of the pot should not be immersed in water. 1/4 to 1/2 strength every two weeks with a soluble general purpose fertilizer.